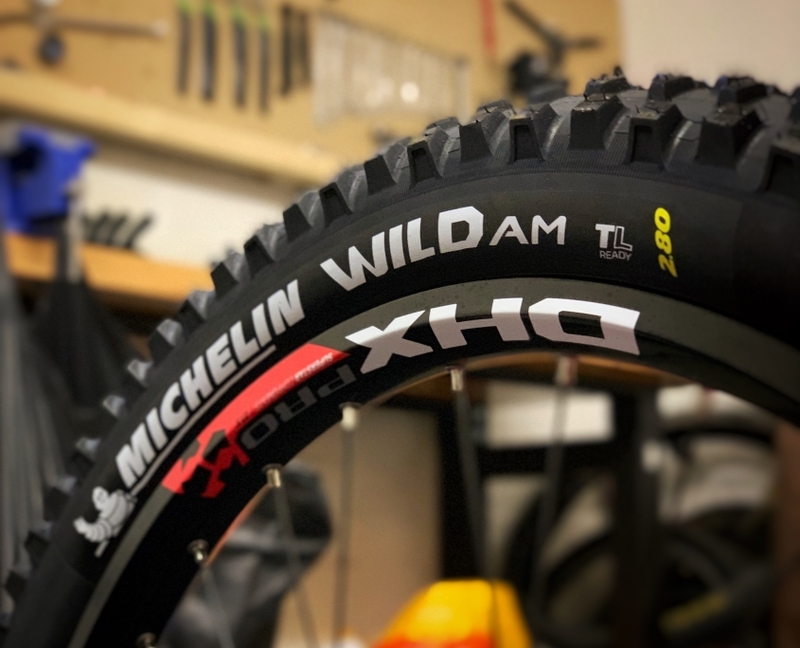 Michelin Wild AM 280 tyre review. OK, quick wee blog for you! First up, these are cheap. Plus size tyres are expensive and these were not. So having already splashed on a 30mm wheel-set to put them on. They were right on the money (so to speak) However, If I hadn’t got these I wouldn’t have been able to try something a bit different and would probably have been running a HRII / DHF combo for twice (three times?) the money. So I have these to finish up what is most likely the ideal setup on my Pipedream Moxie. As you may have read in a previous blog, I’ve tried 29″ 27.5″ and now it’s time for the 27+ option, or as close as I can get! I’m mounting these on a 30mm (internal) rim to get a nice big profile and keep some even volume across the width. Ideally and with most plus bikes a 40mm internal rim is specced, but I think this would be crazy on a such a potentially lively bike. So with what was available, the money I had and the timescale I was working with. So off I went and stuck it all together. My fork is a 29 / 27+ fox Factory 36. The brace clearance on this fork is quite generous even with a big 29er, so with the smaller 27+ wheel and the “less tall and round” profile of this tyre, the whole package sits well below the fork brace. It doesn’t look too goofy and theres plenty of clearance for the Mud Hugger to be mounted. The tyre and rim combo is pretty heavy and as I was in a bit of a hurry, I have tubes inside too. Even with an air-shot, the creased (due to retail folding) bead of the tyre plus the extra internal volume proved problematic to getting a seal in the time I had. They’ve been on on for a while now, so I’ll probably whip them off and try again now they have been seated for a while. First thing I noticed is that I didn’t actually feel that much drag. The way these things look, you’d thing they would be terrible, but no, at least not for me. When the ground gets really packed, like forest roads etc, you can feel the tyre gripping and “moving” under torque, bit it didn’t feel like drag to me, Kinds weird but there you go? Certain riders will look down and find security in a rounder profile, big knobbed tyre. I’m kind of one of them. Running these around the 25psi mark in intermediate weather on a mixture of natural off-piste trails and the more “knackered” trail centre lines brought out a decent bit of performance out of there. Although they did roll a tiny wee bit on very tight turns, it seemed like it was just the casing doing its job and not an under-inflation problem. It was a very predictable thing and I soon got used to it. Putting any more air in this tyre is a no-no though. It just immediately stands too tall and the knobs are way too aggressive to be relied on alone, without the flexibility of the casing. I’ve also now had the chance to try them on some slimy steeps too. I did, though let out a few psi and they were fine. There was a bit of clogging at low speed, but as soon as the speed picked up, they cleared fairly fast. A few folk have scoffed at these tyres for natural riding, but I have found them just fine. The front follows the back… every time! Again, too much air and it just bounced off everything (surprise) Run the rear a bit lower and dig your heels in a bit to make the casing and the tread work best. Theres a 2.6 version available too, so I may give that a go on the rear just so it breaks loose a little more readily as the 2.8 really did grip when deliberately pressed into service. The equivalent Maxxis and Schwalbe tyres in this size are extremely expensive and can be quite hard to reliably find in stock too. So as I said above, these were a cheap solution to get my bike rolling. Turns out that they are actually more than OK. The very soft compound is always a worry, but I guess we’ll see where grip and longevity meet in the long run? At £22.99 a hoop though, I’m willing to take the chance. https://ridelines.co.uk/wp-content/uploads/2019/01/IMG_0541.jpeg 3024 3024 RIDELINES enquiries /wp-content/uploads/2018/12/Ridelines-Mountain-Bike-Tuition.png RIDELINES enquiries2019-02-10 16:48:322019-02-12 20:44:03Michelin Wild AM 280 tyre review. Steel is… Pipedream Moxie first impressions. But in a world where carbon can be laid up to mimic just about any type of material is it (steel) any good? Is it worth the hassle? As I reckon that you average mountain biker has forgotten how harsh a hardtail MTB can really be? I’ve ridden some alloy suspension bikes that can be quite unforgiving, especially with the suspension set up badly, so god knows what your average alloy hardtail must feel like these days? (feel free to let us know) So with all that, is this the answer? The Pinkest of All The Pink Bikes. The Pipedream Moxie in 29″ trim. 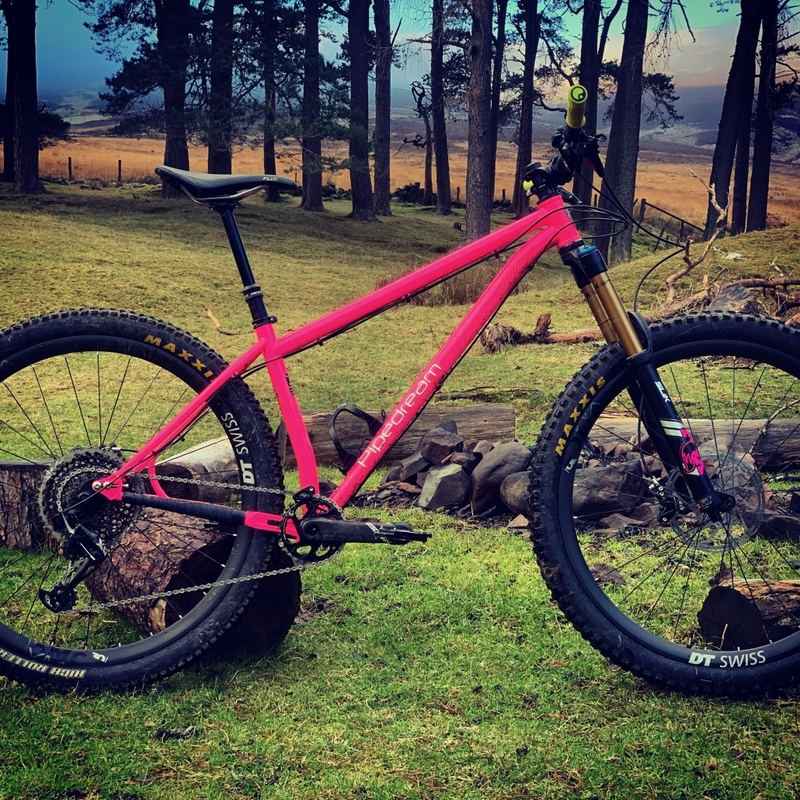 Fist up, thanks to Alan Finlay at Pipedream Cycles for hooking us up with the latest incarnation of their Enduro hardtail, the very pink “Moxie” Its long, slack and low, bloody low! Even in 29″ trim with 165mm cranks it still feels very close to mother earth. Although curiously, in both wheel sizes, I haven’t had a pedal or crank strike yet. Again, I reckon we’re all a bit used to the effect of preload and movement of the BB on suspension bikes that we just come to expect to clip the pedal now and again anyway? So +1 already, it’s very predictable this thing, so much so that I nearly had a few “unplanned manoeuvres” due to the fact that I thought it wouldn’t be! Truth be told that this is the first hardtail that I’ve had that has felt specifically “designed” to be any kind of useful mountain bike. This is mainly because since I bought my Rocky Mountain Element in 1997, my main bikes have all been full suspension ones. In fact I think I’ve had 2 or 3 hardtails in those 20 years and they were all before anyone was really tuning their geometry. At least to the point of real specifics and certainly not for aggressive trail riding. I’m gonna go straight to climbing here. A few past reviews have suggested that a slightly sharper seat angle would make the Moxie climb a bit better and I’d tend to agree, but 76.5° isn’t exactly mega slack and I shoved my saddle forward 10mm and dipped the nose a wee bit, which makes some difference on climbs but isn’t ideal across the board. It’s the 470mm reach and 65.5° head angle on our “long” bike that creates the issue (not an issue) I can deal with it. It’s not an issue because this bike was obviously designed for descending and general hooliganism, where so far it has excelled. All this with a 29″ wheel too! I’ve really done most of my riding on this bike with a 29″ carbon wheel and a 150mm fork (Fox 36 Factory) and less in the 27.5, but both wheel sizes have their benefits which I’ll save for another day. The first ride on this was actually a 30km XC ride and to be honest, I loved every minute. Ok, you lose a wee bit of braking traction on the back end when it gets high-speed spicy, again I think we’re spoilt by suspension in this regard. But the long reach and slack head angle force traction on the front wheel and make you forget about the back end that will predictably follow. I’ve been able to lean on some serious front end braking on this bike too, helping with any speed scrubbing issues on the rear. It’s super comfy too. 4130 chromoly, remember that? The tube-set with a super cult following from back in the day and particularly BMXers. A cold rolled steel-alloy that is super strong, takes a very positive weld and remains flexible to boot. Black magic if you ask me. Anyway, I did notice that this bike has no gussets at the major tube junctions. Seems this is a bi-product of the guys choosing to go for a custom tube-set that can be drawn and welded to their specification. This means no strengthening needed, and no extra materials on these junctions also means a more lively, less “stiff” frame all round. Where stiffness is needed though, around the BB. We see a change to some flat plates that wrap-around the BB very neatly indeed. The finish on the bike overall is fantastic and isn’t compromised ever where folk don’t usually look. Another long XC ride. This time with Standard 27.5 Rims. Let me just say that I’ve now tried this bike in 29″ with DT Swiss XMC1200 carbon 30mm rims (Minion DHF & High Roller 2) and some older DT Swiss E1900 25mm (same tyre combo) I have to say that I actually preferred the 29″ setup so far, but I’ve mostly been mincing around trail centres and doing long XC rides. To be honest, the Moxie excels at both. The 29″ setup felt indestructible though. On steep terrain it was so surefooted that I actually forgot that I was on a hardtail. I would imagine its pretty hard to optimise a bike for 2 wheel sizes but so far it seems to be working? I also took the bike out with Std 27.5 wheels and felt it limited the bike. I didn’t like it. It felt skittish, rear grip felt like it was a problem all the time and I just felt like the back end wouldn’t follow the rear. So, I’m hoping that the next experiment (30mm 27.5 rims with 2.8 tyres) will be the one. This should give closer to 29″ rolling size and but not push the limits of tyre clearance as the wheel will run through the frame slightly further back. I would honestly keep the 29″ setup, but the tyre width I’d like to run on the rear buzzes off the frame at the chain stay yoke more often than I’d like. OK, not an in depth review, but a first impression. I’m gonna give it a shot in 27+ and get back to you as I honestly think that it’s gonna be the sweet spot. If I could just get a bit more space for the 29″ tyre I wanted, I’d have left the big wheels in though. But I guess I’ll know the score on all points if I try it. So I’ll be back with that! https://ridelines.co.uk/wp-content/uploads/2019/01/IMG_0425.jpeg 3018 3018 RIDELINES enquiries /wp-content/uploads/2018/12/Ridelines-Mountain-Bike-Tuition.png RIDELINES enquiries2019-01-09 09:34:272019-01-09 15:54:37Steel is... Pipedream Moxie first impressions. A story of caution & responsibility. Readable in less than 3 minutes? It’s a recent Saturday and I’m standing in the buzzards Nest Car Park at Glentress. I have my mountain bike tuition hat on. Fully fed, rested and motivated, I put down my risk assessment and start chatting with my client. It was a windy morning, but I swear I heard a voice shout “help” Hmmm, I thought? “HELP” came the cry once more. Did you hear that? I said to my client. Hear what? he said. HELP… we need HELP! Shouted a flailing figure emerging from the freeride Area. Long story short, there were 3 lads, early 20s on recreational, low end hard-tails, dressed for the spring and completely unprepared for the scene that was waiting for me. Their friend, a young man in his early 20’s was out cold, not moving, with his extremities pointed in every directing apart from the right ones. In and out of conciseness, freezing cold with the side of his face swollen and cut in a bad way. He’d apparently ridden the wooden drops and hit the jump at the bottom carrying way too much speed, hit the jump, then cartwheeled his way to unconsciousness. A pretty serious accident as it turned out. I won’t go into the details of how these guys did not have any idea what to do with their friend, who to call or what to tell them this situation. But by the end of the whole scenario he was in a state of continuing shock and borderline hypothermic despite lying on a matt with my coat on, a silver blanket on, an orange blanket on and inside an emergency shelter. At the time, this one really did seem like a close call. The guys didn’t know his full details, his full name, his next of kin, any of his friends and family or pertinent information about him either. They were friends from Uni just out to ride at Glentress. Their pal was also the driver, so they were stuck at Glentress in the rain with a broken bike and the worry of it all. One seriously injured young man with a potentially serious head injury. Two stranded, cold and shocked young guys. A callout for both the Police and ambulance service. Possible loss of earnings for me. A wasted journey for my client. A possible refund for my client with possible bad press for Ridelines. Cost of equipment left at the scene. Ongoing medical consequences for the downed rider. Now accidents will happen, but these guys were just out of their depth in challenging conditions, riding beyond their capabilities. The picture below is the result. A while ago we posted on facebook about the amount of time and money we spent on first aid over just one month this summer. The post caused a lot of feedback, and although not one of these costs incurred were spent one our clients, being on the hill with a big backpack and a uniform essentially puts a target on your back for such things. I’m sure lots of our colleagues at other MTB companies can relate? So in short this is not a lecture, more of a cautionary tail. Be prepared folks, know your limits and how to act should you be as unfortunate as our friends above. Heres a few tips. A quality multitool with a chain-tool. A spare “quick link” for your chain. At least a litre of water. Some high carb food or energy bars. It goes without saying that you should know how to change a tube (video here) and join a chain (video here) you’d be surprised at how many people that carry stuff don’t know how to use it. Your first aid kits need mainly bandages and stuff to stop bleeding as apart from broken bones, bleeding is easily the most common symptom of an accident that we come across. A rule of thumb (not hard and fast) an ambulance will usually only efficiently attend an actual postcode, so at least have that. Although these can be miles in length and useless if you have no door number. 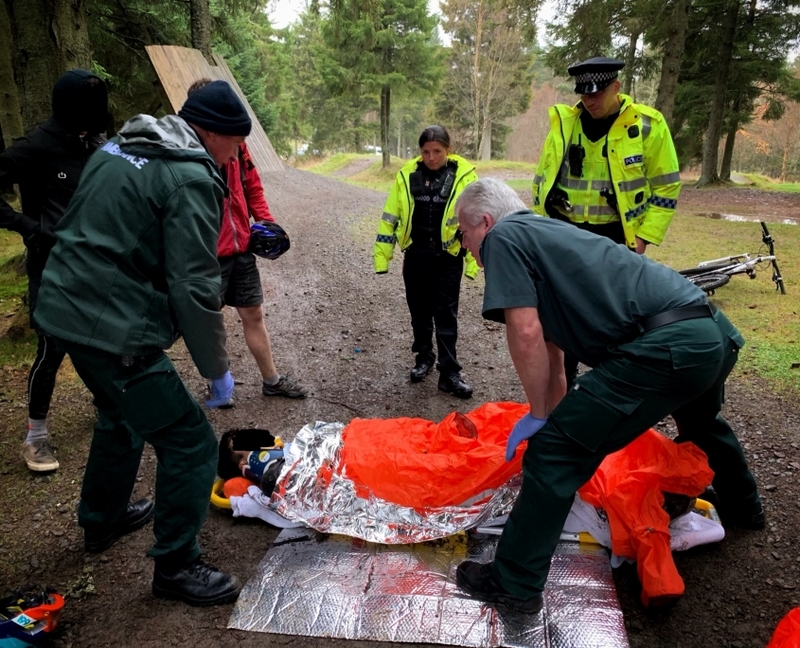 Usually though out on more remote trails and trail centres, you should be calling the police and asking for Mountain Rescue. For that, you’ll likely need a grid reference. There’s plenty of free phone apps that will do that for you too. But really it’s best to know where you are and be able to read a map to a basic level. Also, you could get yourself on a first aid course? You’d be amazed at the minimum you could do just to make someone comfortable or even save their life? Anyway, have a great 2019, be safe out there and look after your MTB brothers and sisters! Everyone has the odd day where they feel like they just plod along right? 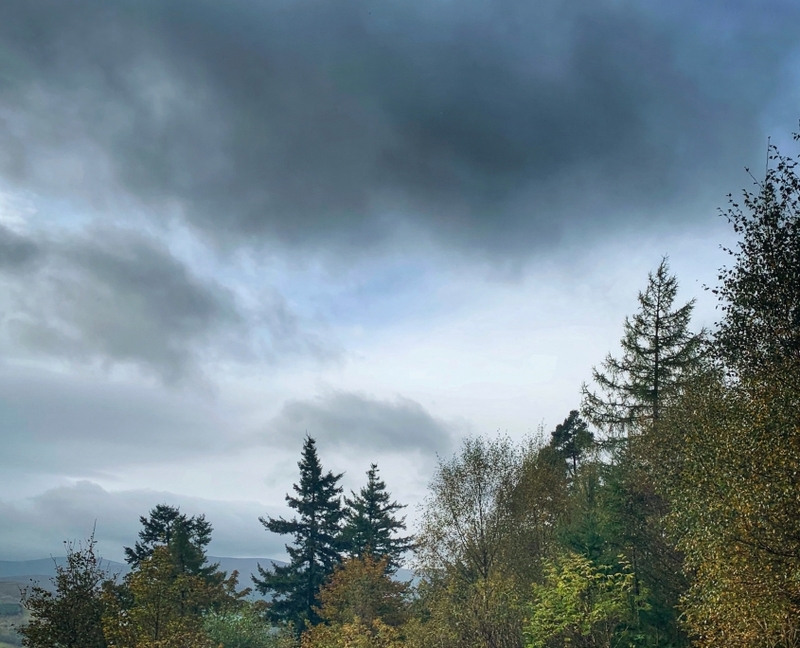 We can tell you that there have been more than a few times that we have looked out the window, sat in the van just thinking that we’d rather be somewhere else than out in the wilderness in the freezing cold, wet weather? But this probably falls into the less than 1% category of days we find ourselves giving skills lessons or guiding people out on Mountain bike rides. We genuinely love what we do. Offering mountain bike skills lessons in Glentress counts us amongst the luckiest instructors out there. Fabulous facilities, great countryside, great people and the support of the community around us makes our job that little bit more special. When laying on Guided mountain bike rides for big groups, the surrounding hills and valleys have views for miles that change with every season. This is why the Tweed Valley is such a special place to be based. 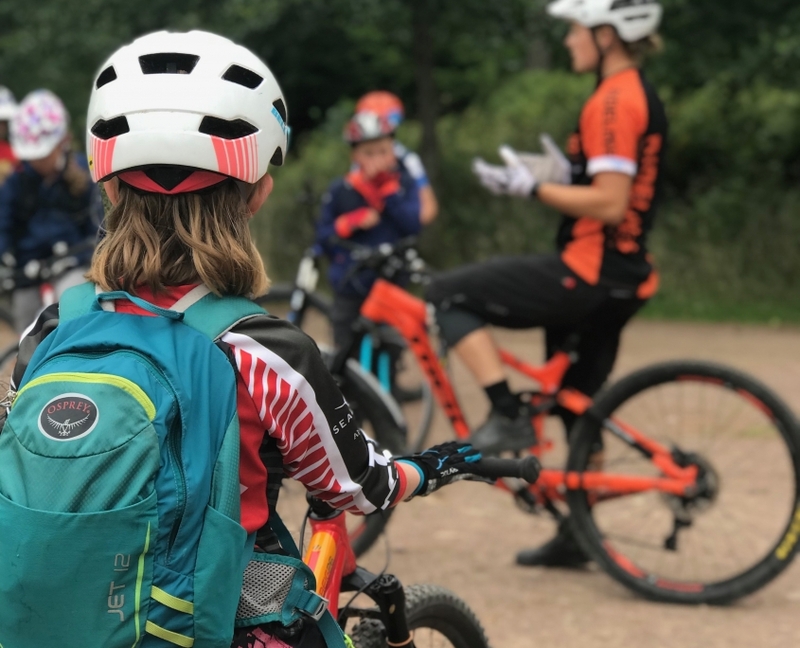 Mountain Bike Skills Tuition has been our tagline for years, but in 2018 the business has wandered all over the map with regards to how we have seen different groups of people react to mountain biking. Our “bread and butter” has always been MTB skills instruction and theres no end in sight to seeing clients enjoy the new techniques we’ve given them. But this year has seen us reach out beyond the singletrack and try to reach more people than ever with the message that mountain biking and cycling in general can be fun for almost anyone. Heres a few highlights of the diversity of 2018. We’ve continued to grow our scheduled courses at Glentress & Innerleithen. With courses like Enduro-Prep and and our Intermediate skills group courses, we’ve been amazed by the way riders can gain confidence in just 6 hours of riding. We’ve learned so much from these courses as they are totally inclusive and pressure free. Our 1:1 clients continue to grow too. It’s a totally different dynamic and tends to be a little more “colloquial” in its nature. Some of the funniest and most rewarding days on the hill come from our Skills lessons. Fewer of these happen as people get more adventurous on their bikes and learn to be better equipped to travel further into the wilderness. But this year has been a bumper year for our guides too. Stag do’s, work colleagues and just groups of pals up for a holiday can form the basis of a great group ride. W’ve dealt with clients from all over the world too. On one day out this year Allan has a Scotsman, South African, Canadian, an Israeli and a German out on a ride. Truly amazing not that they picked Ridelines, but that they picked Scotland to ride their bikes. 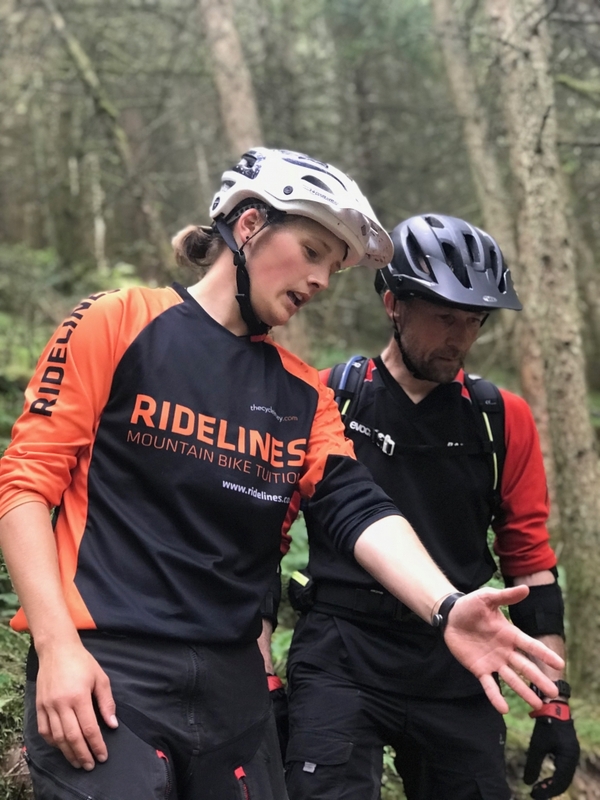 As most will know, Ridelines is one of the leading centres in the country for training and assessing candidates for the British Cycling Mountain Bike Leader program (UKMBLA) The three levels of MBL awards are very demanding on both the tutor and clients, but the reward for both is very high indeed. 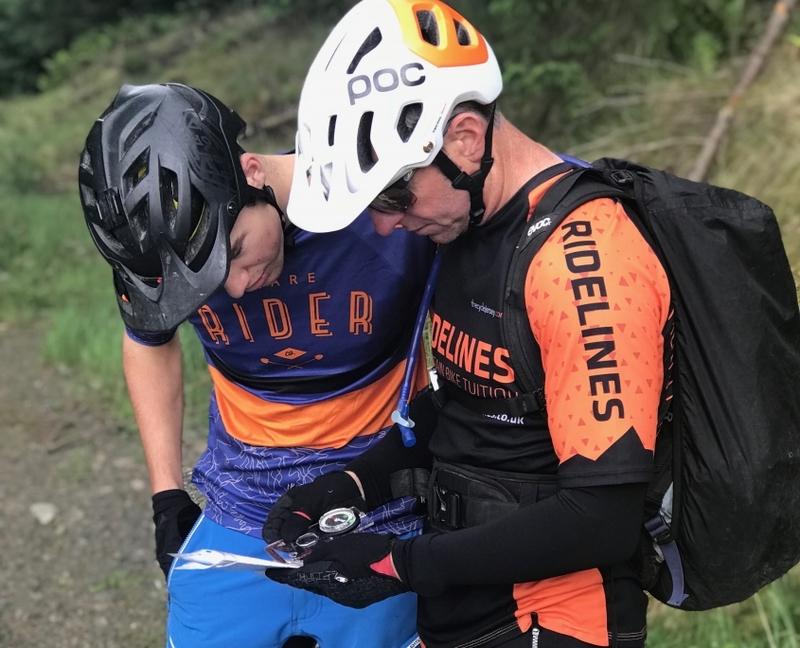 We love knowing that we’re helping to create responsible riders that will pass on the the skills and techniques of effective leadership to other riders that may decide to go the whole way to qualifying as leaders themselves. This year, a record number of candidates came through the program and the quality was incredible. 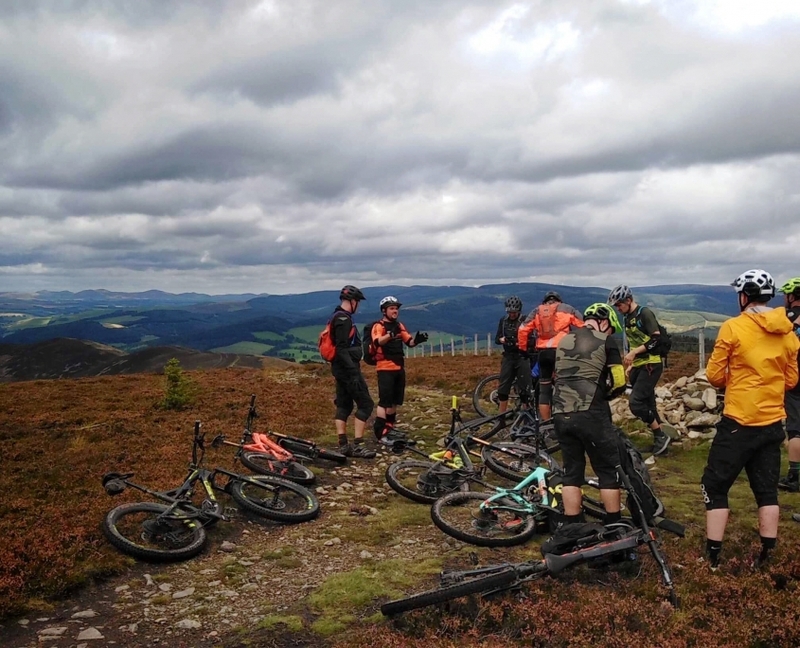 From MTB clubs, charities and local authorities to workplace colleagues and independently adventurous individuals, the UKMBLA is starting to appeal to a huge demographic within the MTB community. Every year ridelines create dozens of new MTB Leaders. Where do we start? Kids Camp started as a 2 week project in the Scottish summer holidays. A few years later and in 2018 we hosted 8 weeks of Kids Camp in Easter, Summer and the October holidays. That’s 192 kids just on the Scheduled courses alone! A big effort on the part of our instructors is needed to keep these little rippers interested and focussed on the task, which is of course FUN! 2019 Ridelines Kids Camps will see 10 weeks of courses offered scheduled throughout the school holidays. A whopping commitment from Ridelines in response to a very high demand in requests for camps to be held across both Scottish and English school breaks. Ridelines Kids Camp has 10 weeks scheduled in 2019! 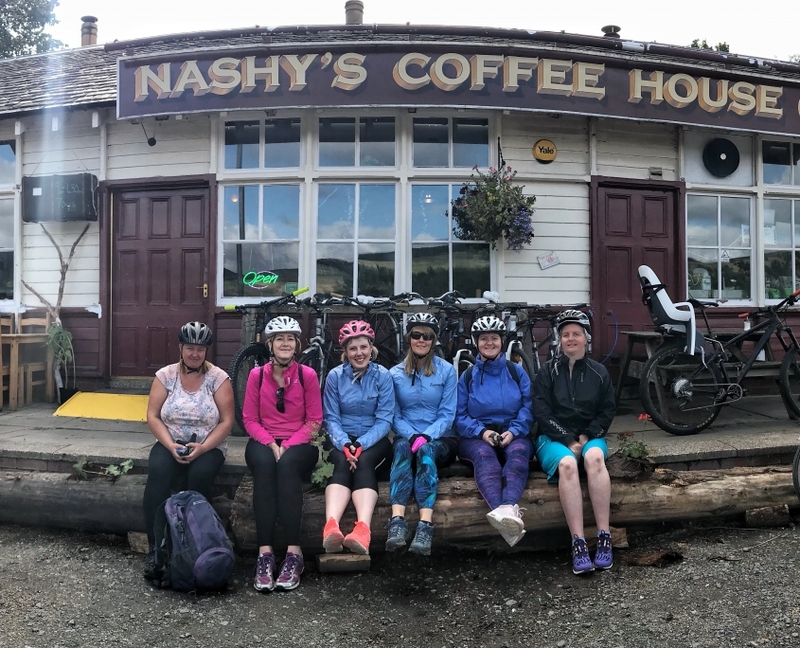 Easyriders was a Borders Council initiative to get more women on their bikes in the Peebles and Innerleithen area. Needless to say in we stepped with an offer to run the whole kit and kaboodle! 6 weeks and 54 sessions later and we’d delivered a progressive course to 120 women covering everything from maintenance to road etiquette. The feedback from Easyriders has been hugely positive and the reward for our instructors has been immeasurable. They actually think that Easyriders may be one of the best things they have ever done. After Easyriders we offered some basic MTB courses for the same women exclusively in a female peer group. Again, the uptake was great and we ever converted a few roadies onto mountain bikers! All of our courses are open to all genders and we coach plenty of women as a matter of course. But next year will bring some real changes to our women’s offering. So stay tuned! One of our awesome Tweed Valley Easyriders groups. This has been our biggest year for educational experiences. We have led, guided and taught everything from private schools and charities to special needs and disadvantaged groups. It never fails to amaze us how Mountain Biking can be a great leveller in all of these peer groups. Mountain Biking for us can be used as a tool for therapy, whether for mental or physical issues, we have found that a large number of clients with these issues have been overwhelmingly positive about their exposure to the outdoors and riding bikes. In 2019 we’ll be unveiling some exciting new educational and therapeutic products. Ridelines is regularly involved with charity groups and educational mountain biking. 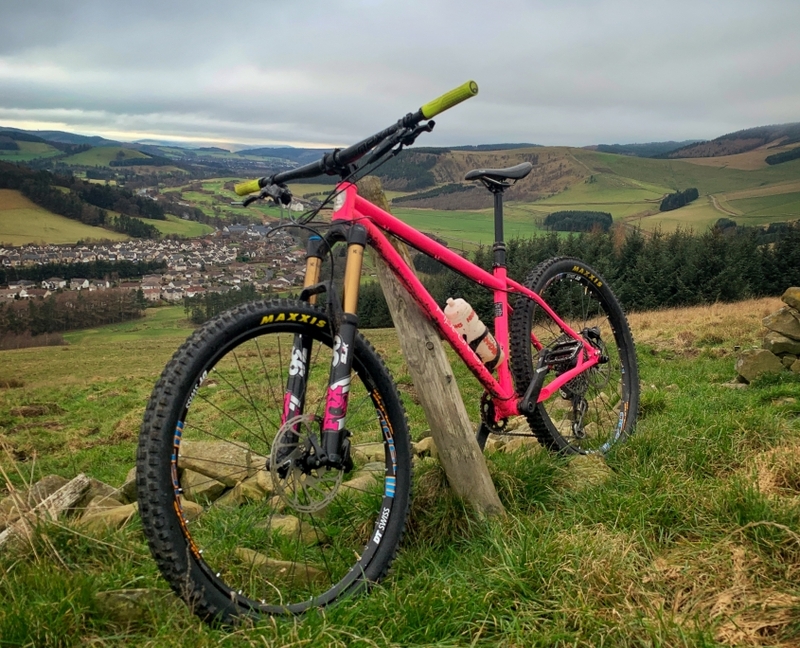 The DMBinS Scottish Cycling Mountain Bike Conference 2018. We attended this years bi-annual conference in Aveimore not really knowing what to expect. But what the few days we took off to travel up and soak up the event were very worthwhile indeed. Some of the excellent peer group workshops included e-bikes, trail building, MTB leadership, environmental issues and many other hot topics. There were excellent speakers and delegates from all over the world (and outside) our industry, but the highlight of the conference for us were the new guidelines for unauthorised trail building issued by the National Access Forum in partnership with DMBinS and the leading players and businesses from land management and Mountain Biking. We’re very much looking forward to playing our part in what is to come for Montain biking in 2019. After a great few days at the DMBinS Scottish Mountain Bike Conference in Aviemore. 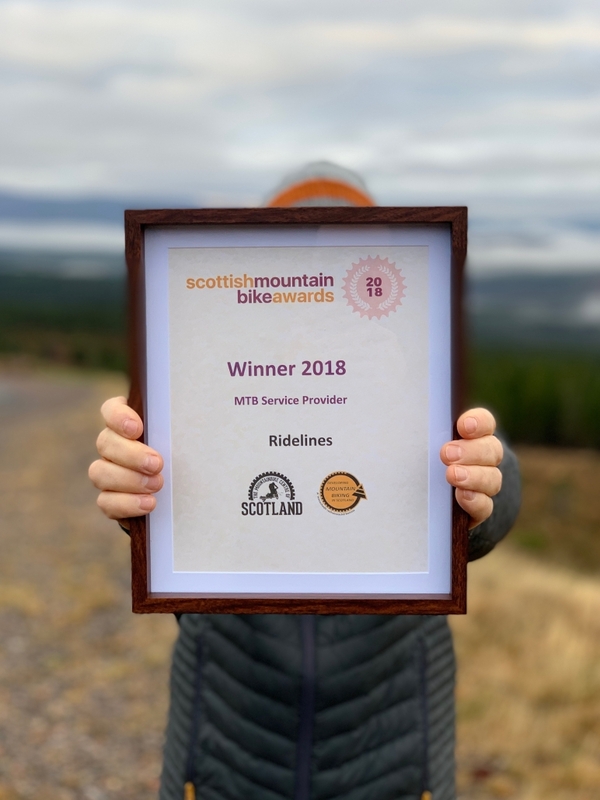 A nice little cherry on top of a fantastic trip away was being afforded the honour of being recognised as the 2018 Scottish Mountain Bike Provider of the Year. At the MTB awards ceremony. It’s been a long journey for Ridelines, seeing people come and go as members of our team, all whom have contributed to the business in their own unique ways. We’d like to thank everyone who ever pulled on the jersey and represented Ridelines out on the hill. The list is long, but very distinguished! 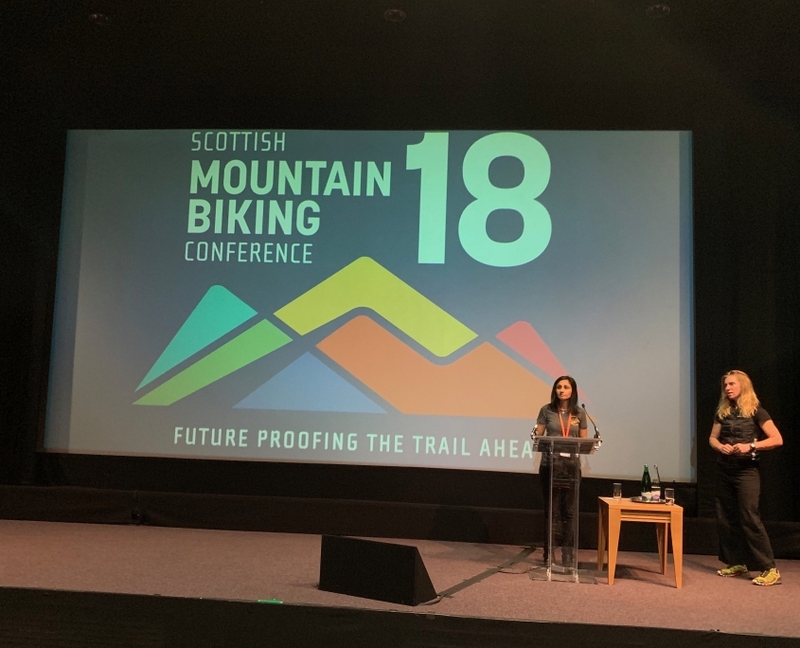 Thanks to everyone at the conference, the delegates, Scottish Cycling, DMBinS, Edinburgh Napier University and the mountain biking community at large for supporting us from the grass roots that started us. It was great to watching Andy try to smile whilst collecting this award. Thank you all so much. Here’s to an amazing 2018 and a better 2019 for all of our clients and indeed our colleagues in the industry. It’s hard to pick highlights, but above is just a few points that stick out as things that we are especially pleased about. Mountain Biking is life at Ridelines. We never tire of it and we’re constantly looking for ways to evolve and improve what we do. Thanks to everyone who supports us on our selfish personal journey to try and keep riding bikes for a living!